I am obsessed with soft/fuzzy clothing. I am currently wearing a velvet skirt (one of three that I own, and I'd love to have more) despite the fact that it has WARMED UP to -10 degrees Celsius outside. (And yes, I WAS outside, I went to Starbucks.) I nearly always have a shawl on, of some degree of fluffiness. And my newfound obsession with fingerless mitts fits the trend, as those are also always made of soft yarns. See what I mean? This picture is actually a good representation of the colour and texture: this thing is a rich cobalt blue and PLUSHY. I hardly ever wear it without at least one compliment, and I have been mauled by more strangers than should be legal. Clearly, time to replace the cheap crappy boots. However, the shoe stores, to my surprise, are now filled with sandals. I had heard of this whole "can't buy stuff in season thing", but this is the first time it reared up and bit me. It is February. It is Canada. It is COLD here, people. Why can't I buy boots? Actually, I COULD, if I didn't mind four-inch spike heels and no treads. But I did mind this. Quite a lot. As well, due to my past blood clot, my right calf is a good inch bigger than my left, which makes high boots tricky, but my skirt-wearing self can't get away with ankle boots. And then I saw boots. In the clearance area. Tall, with fake furry lining AND fur sticking out the top. Black fur. SO soft. 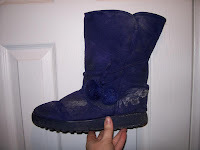 But the boots themselves were an odd nylon, almost greyish instead of black. (You're understanding why they were in the clearance, yes?) I tried them on, and they looked strange with the coat. And they were insanely warm. But they did fit both calves, and they were furry. And I likes me furry clothes. Even just standing in these boots, my feet started to get overheated. I can't imagine how I'd survive wearing them for more than five minutes. But, as mentioned, furry. The boots are a bit loose on my left calf and a close (but not over-tight) fit on the right, and I think they look not bad with my skirt. I just hope they don't leak. Because I am NOT trying to replace them any time soon! Aardvark is coming along but is not yet at a point where I can explain it to anyone. But it IS coming along, and that's good! I hope to be able to articulate it to some degree next week, and when I can, I will post here AND make it a page on my web site. oh, WOW! I LOVE the coat!! I dislike shoe shopping, I rarely find what I am looking for, and when I do, it is either wrong texture/materials or color. 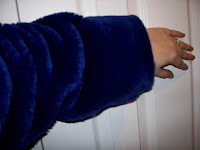 February 6, 2009 at 1:11 p.m.
February 7, 2009 at 11:21 a.m.
Do you feel like Cookie Monster in the coat? I think I want one. February 9, 2009 at 1:34 p.m.